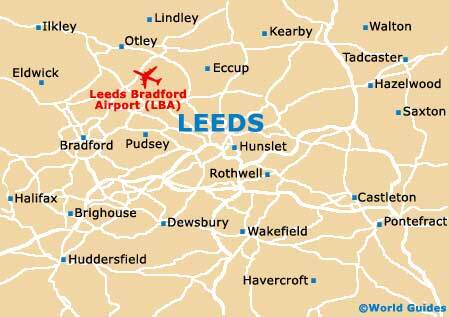 Lying within the historic city of Leeds are a number of important and often striking buildings and landmarks. Located just under 20 minutes to the north of the city and regarded as one of the 'Treasure Houses of England', Harewood House is a grand 18th-century manor house, with spectacular gardens that were originally landscaped by Lancelot 'Capability' Brown. Slightly closer and standing to the south-east is another grand country house, Temple Newsam House, which features a vast estate comprising formal gardens and areas of dense woodland. 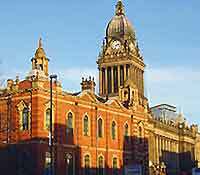 Within the city centre itself, notable sights include the Royal Armouries, Thornton's Arcade and Leeds Town Hall, which was officially opened by Queen Victoria in 1858 as part of a grand ceremony celebrating the arrival of this important Victorian civic building. 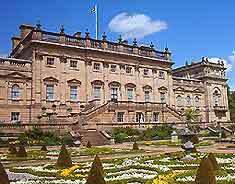 Harewood House is a major historical landmark of great importance and features a host of antique furniture, historic paintings, ceramics, an excellent playground for children, a café and a gift shop. The Bird Garden is worth looking out for and contains some 90 different species, over 30 of which are considered to be either endangered or vulnerable. Of interest to soap buffs, part of the grounds have featured in ITV's Emmerdale soap opera since 1998, with a realistic purpose built stone-clad timber village being used for village scenes. Leeds Infirmary was built in the mid-19th century and stands proudly in the city centre, being officially opened in 1868 by the Prince of Wales, who later became King Edward VII. With impressive Victorian architecture and a Gothic-style facade, the Infirmary stands close to the Town Hall and Millennium Square, and really is quite impossible to miss. The original building is Grade-I listed, although has been sympathetically expanded a number of times over the years. The rather curvaceous Reclining Woman is an important bronze sculpture and can be found outside of the City Art Gallery, contrasting with the austere limestone walls. 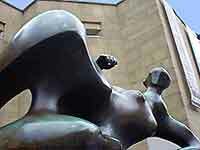 Created by famous artist Henry Moore in 1981 and actually his very last large-scale sculpture, the Reclining Woman measures 221 cm / 7 feet in length and has become a much-loved monument in the city centre. Temple Newsam is one of the most historic mansions in this area and lies a little more than 5 miles / 8 km to the south-east of the city centre. Renovated in the early 17th century and now owned by Leeds City Council, attractions include a large collection of grand paintings, a working farm with rare-breed animals and annual summer concerts, such as Party in the Park and Opera in the Park, both of which are held in late July and are completely free. The grounds are particularly notable, being landscaped by Capability Brown in the 18th century and also feature more formal parterre gardens. 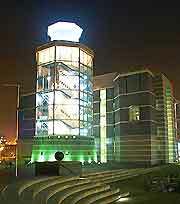 The Royal Armouries is situated within the trendy waterfront area, alongside the River Aire. Built in the mid-1990s to house an important collection of arms and armoury, this is one of the most eye-catching modern structures in the city and comes with large collections of militaria. There are also various hands-on exhibits and numerous displays spread around the six themed galleries, which are named War, Peace, Hunting, Oriental, Self Defence and Tournament. For a small charge, you can often watch falconry displays in the Tiltyard. Centrally located Thornton's Arcade was one of the earliest shopping arcades to be built in the city and features a striking-glass roof, an impressive clock and many Gothic-inspired features, as well as a host of designer-label shops. As you explore the arcade, look out for the Ivanhoe Clock, which chimes on the hour and features mechanical Robin Hood characters, including Friar Tuck and others. The Town Hall dominates the heart of the city centre, being sandwiched between the Britannia Chambers and the Central Library, where it is a spectacular building boasting many impressive features. With classical Victorian-style architecture, ornate ceilings, period features and a domed clock tower, this landmark was built in the 1850s and regularly plays host to concerts, organ recitals and other prominent city events. Interestingly, the Town Hall remains amongst the city's tallest buildings and also ranks as one of the largest of its kind in the whole of the UK. The striking Lotherton Hall is set in large impressive grounds next to the village of Aberford, roughly 12 miles / 19 km to the east of the city and close to the M1 motorway. This grand country house contains a number of valuable paintings, antique furniture and much silverware, whilst the estate is home to herds of wild deer. The landscaped gardens are a particular treat and boast a collection of aviaries housing flamingos, owls and rare exotic birds. Thwaite Mills lies within the south-easterly suburb of Stourton and is an important reminder of the industrial past that brought the city such great wealth many years ago. Standing next to the River Aire since the 1820s, the mills are still in working order and include an interesting museum, which opened in 1990 following a major restoration project lasting more than ten years.